For the past two decades the push has been to provide Broadband connectivity to residents around the world. Broadband had historically been defined as low as 2Mbps, while today this definition has been pushed to include Gigabit speeds. With the market demanding Gbps connections for households, both single family unit and multiple dwelling units, and the cost of running fiber to the front door, wireless is being seen increasingly as the solution. But not just any wireless system. 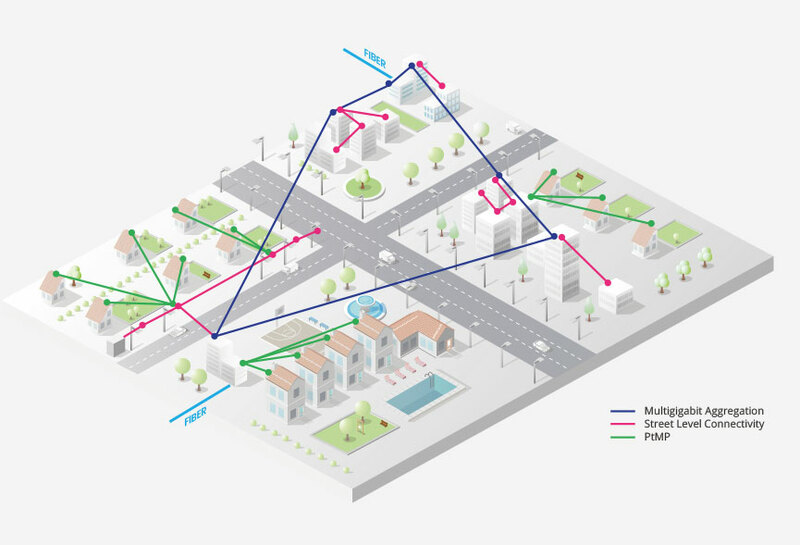 Only the mmWave bands have the spectrum and capacity to deliver multi Gbps interference-freeconnections. With our PtMP Multihaul™ series Siklu offers cost effective Gbps solutions to allow carriers and service providers the ability to serve customers beyond the reach of the copper or fiber networks. Combined with the point to point EtherHaul™ products for multi aggregation and the MultiHaul™ for MDU connectivity plus extensive software tools, Siklu delivers complete solutions. Many Single Family homes are on lots with the home dozens of yards away from the street. The street where the fiber runs. Getting from a Service Provider’s fiber network to the front door, the last mile, can be cost effectively and rapidly delivered with Siklu solutions. Whether its an office building or an apartment complex, Multiple Dwelling Units present both challenges and opportunities for Gigabit Wireless Access. These units can house anywhere from half a dozen to dozens of homes and/or businesses. With Skilu’s range of solutions from 1Gbps up to 10Gbps, these opportunities can be approached with the promise of low cost gigabit connectivity. A complete solution for GTTH requires not only a PMP access option for the last hundred feet, but this access traffic must also be transported to the fiber or Internet POP. The backhaul or aggregation links between PMP hub locations and the POP need to have enough capacity to support multiple PMP Base Stations and hence need multi gigabit capacities. With Siklu’s complete portfolio of PTP E band and V band radios service providers have multiple options to choose from.